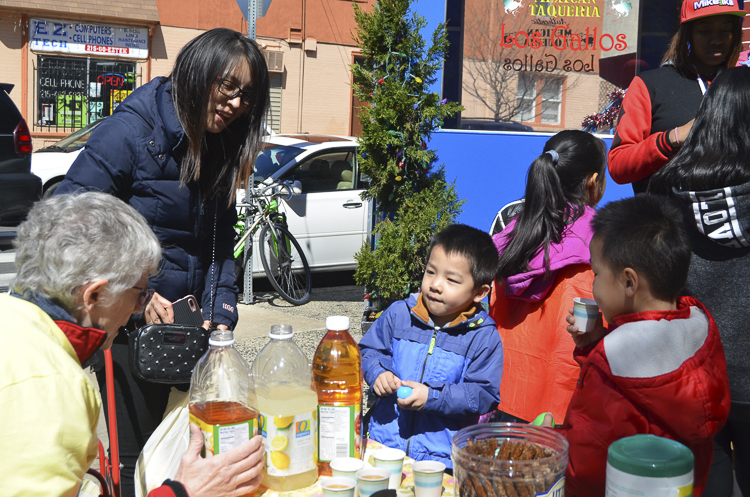 On Saturday afternoon, April 8, neighbors came to a celebration of the installation of permanent ‘street furniture made from recycled objects’ at two specially chosen corners in Southeast Philadelphia, 10th & Wolf Streets and 7th & Jackson Streets. The artist selected to create this art came from the Recycled Artist in Residency (RAIR) program. RAIR artists challenge our notions of refuse as art when they create an art installation by scrounging through a massive trash heap. 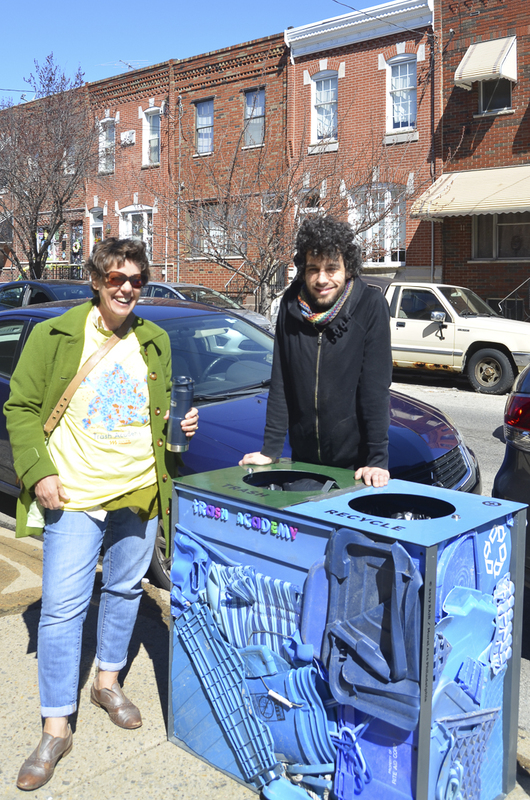 These artists do their ‘dumpster diving” at Revolution Recovery’s three-and- a-half- acre lot on Milnor Street in Northeast Philadelphia, full of waste diverted from landfills for reuse. What people will see at the corners of 10th & Wolf Streets and 7th & Jackson Streets will likely shock and puzzle them, as they are meant to do. The colorful creations (benches, planters, and trash receptacles) attract the eye and are designed to get people to think about TRASH. All this started with the TRASH ACADEMY, which grew out of broader initiatives by Mural Arts and its partners to engage a community in a target area with a lot of diversity, using art to facilitate communication and providing a community meeting space. In early 2015, a double vacant lot at 632 Jackson Street became the temporary hub for Restored Spaces, also called Playgrounds for Useful Knowledge, where business owners, residents, families, artists, and invited guests met to communicate. One problem that everyone put high on the list of concerns was trash! The TRASH ACADEMY started meeting in the fall of 2015. 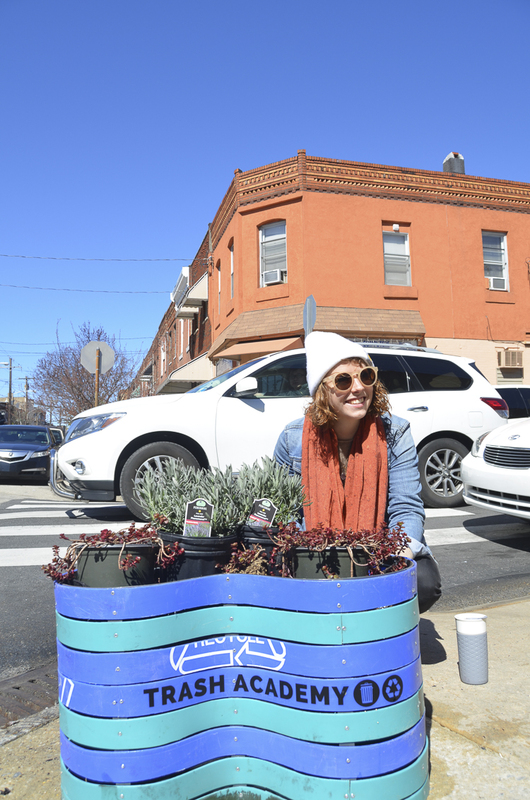 In March of 2016 a group of committed residents and business owners came together with Mural Arts artist intern Margaret Kearney and Scott Quitel of the LandHealth Institute to work on proposing a solution to test. The group met every two weeks throughout the summer to research, photograph trash and brainstorm. A large percentage of the group participants were also active members of the Lower Moyamensing Civic Association (LoMo). In addition, many invited guests participated in the evolution of the concept, namely Shari Hersh, Mural Arts founder of Restored Spaces, environmental activist Ron Whyte, community organizer Beth Uziak, and Jennifer Slavic of Councilman Squilla’s office. The concept that evolved as a way to bring about a solution to the problem of trash was the idea of utilizing the public nature of corners as an asset for addressing the trash issue. In other words, creating a corner where people go to eat and shop into a positive space, a showcase that might be replicated. Like a Town Square, it is hoped that such a corner might build a sense of community among residents while at the same time address real issues and needs such as the storage of trash cans, outdoor seating, and residential dumping in public trash cans. 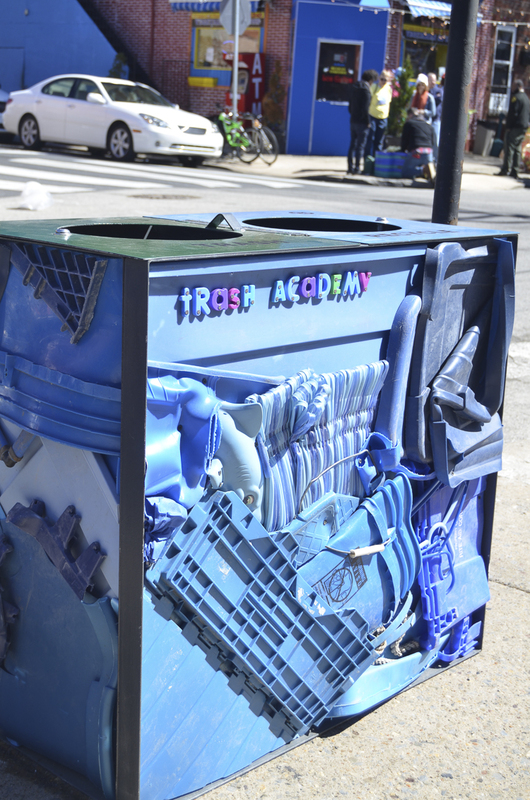 Using a disciplined process, the TRASH ACADEMY participants narrowed suggestions down to two corners: 10th & Wolf Streets and 7th & Jackson Streets. Criteria included finding supportive business owners and neighbors who would “adopt the corner” similar to a Block Captain. They got buy-in from the owners of three businesses at 10th and Wolf (Los Gallos, Frida Cantina, and Villecco Taylors) and four businesses at 7th and Jackson (Friendly Market, I Heart Cambodia, Star Point Salon, and El Sabor Cantracho). Los Gallos, Frida Cantina, I Heart Cambodia, and El Sabor Cantracho are making this locality into a foodie’s destination. They all have carryout/Facebook. In the fall, after selecting the corners and the artist, the TRASH ACADEMY put on a fun and informative promotional family event at the corner of 10th & Wolf. It was promoted with the invite, Come crash our trash party! The artist from RAIR was there to present several design ideas and solicit feedback. To test the solution, the art will be installed at these corners for one year. The hope is that these demonstration corners will lead to the creation of similar corners throughout the city, with positive results. More information about Mural Arts’ Restored Spaces initiative and Playgrounds for Useful Knowledge project can be found on the Mural Arts’ Philadelphia web site, https://www.muralarts.org. FDR Fest on Saturday, April 15!